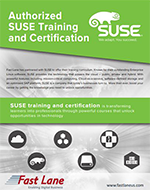 Fast Lane has partnered with SUSE to offer their training curriculum. Known for their outstanding Enterprise Linux software, SUSE provides the technology that powers the cloud – public, private and hybrid. With powerful features including mission-critical computing, Cloud-as-a-service, software-defined storage and an optimized SAP platform, SUSE is a company that today’s businesses turn to. SUSE training and certification is transforming learners into professionals through powerful courses that unlock opportunities in technology. More than ever, boost your career by getting the knowledge you need to unlock opportunities. Interested in learning more about SUSE Certification?